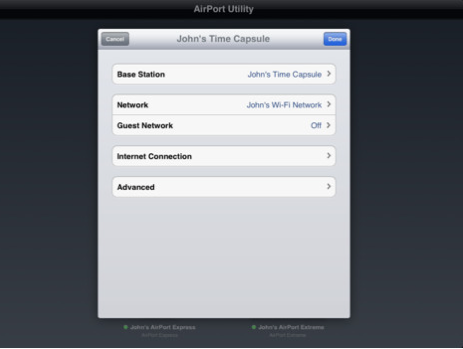 Right on the heels of releasing the free Find My Friends app just moments ago, Apple has also issued the long-rumored AirPort Utility app which lets you manage your AirPort Extreme, AirPort Express and Time Capsule base station right on your iOS device. In fact, the app comes with some pretty advanced features letting you effectively manage your networks and base stations, akin to its desktop sibling. The software is provided as a universal binary which supports both iPhone/iPod touch and the iPad’s bigger canvas. You will no doubt love a nice graphical overview showing your wireless network and the attached base station. You can also get a better look by pinch-zooming, which works only on iPad. To get the underlying network information, simply tap an object. You can also perform a firmware update on your base station using this utility. To download the app, access Settings on your iOS device, go to your WiFi setting, tap the little blue arrow next to the currently active network and then hit the Manage This Network button at the bottom of the sheet. 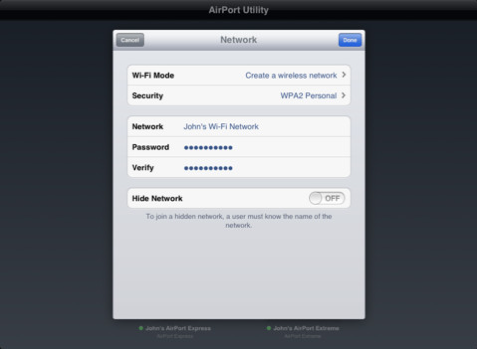 Use AirPort Utility to manage your Wi-Fi network and AirPort base stations, including AirPort Express, AirPort Extreme, and TimeCapsule – right from your iPad, iPhone, ir iPod touch. See a graphical overview of your Wi-Fi network and devices. Change base station and network settings, or manage advanced features such as security modes, wireless channels, and more. 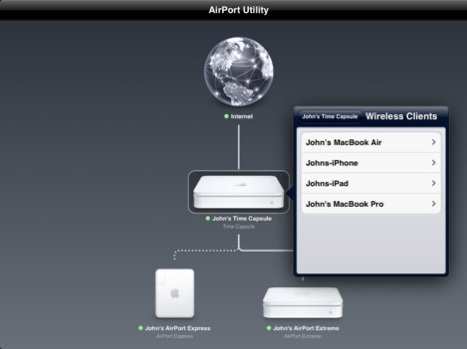 AirPort Utility works with all Apple 802.11n Wi-Fi base stations, including AirPort Express, AirPort Extreme, and Time Capsule. We’ve included four nice-looking screenies and the official features list right below the fold. Note: MacStories has even more screenshots detailing the various aspects of the app, including setting up your network, changing settings, managing an AirPort base station and more.